Coming up with healthy Halloween treats is no easy feat! I always want to create festive dishes that say spooky all over them, just without having to add tons of food dye in the process -- therein lies the big time challenge. I'm also attempting in my own little way this year to make recipes that have at least an itty bitty amount of nutrition in them, so my kids aren't getting the energy to trick or treat all night from candy alone. 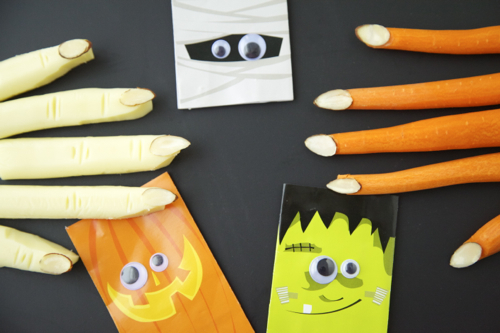 These Halloween Fingers are creepy, spooky and, yes I admit it, kinda gross looking, but given evening's theme they're also pretty darn cool. They're essentially an inventive way to serve carrots and cheese. You can scatter the fingers alongside other entrees, make a plate of them for everyone to grab from, or even fill a bowl with Black Bean Hummus and plant the fingers inside it to give the illusion of a hand clawing its way out of the ground. Sounds fun right? 1. Wash and peel the carrots. Using a pairing knife, slice a thin piece off the tip of each carrot to form a flat surface on one side. 2. Shape one end of each cheese stick to resemble a finger. Shave a bit off of each side and round out the tip. Make small notches in the cheese about 1 inch from the tip and again about half way down the cheese stick to resemble knuckles. 3. Place a dab of hummus on each finger tip and adhere the sliced almonds to create fingernails. 4. Serve with Buggy Nacho Dip or Black Bean Hummus to create a spooky scene.